Wichita Toy Train Club, Lionel Ambassador and home to 75 members is located in Wichita, KS. The Wichita Toy Train Club and Museum is dedicated to promoting model railroading in the Wichita area and south Kansas. The club currently hosts open houses on the 2nd and 4th weekend of each month and the current building has 4000 square feet of layouts. The “O” gauge layout includes hands on learning for kids. In addition to the 4000 square feet of layouts the club features an “O” and “S” gauge traveling modular layout that are taken to various events and train shows in the area. They dedicate themselves as an organization that loves the model railroad hobby. This was the first annual Kansas Raifest that included tours of Union Station, a Kid's Depot fun area,Operation Lifesaver, Antique Trucks, Trolley rides, and the full size trains of the Great Plains Transportation Museum. This the first time since 1979 that the public could visit the inside of Union Station of Wichita. The Wichita Toy Train Club set up an O Gauge modular layout inside the Station and ran trains on three mainlines from 9 am to 4 pm. Kids of all ages got to operate a dozen Lionel accessories with the pushbuttons located around the layout. Estimated attendance was over 1000 people, so it may make this an annual event for Wichita. July 25-30, 2016 - Kansas City, Missouri - 46th Annual LCCA Convention - WTTC is displaying the O Gauge Modular Layout at the convention Thursday – Saturday, July 28 – 30. If you are going to LCCA, you may want to bring trains to run. Families in attendance ran Lionel and American Flyer trains on our racetrack layout using conventional ZW transformers. Thomas the Train was featured on one of the O-gauge tracks. They also operated accessories on two other O-Gauge layouts and saw trains run on the new permanent S-gauge layout...the track on the S-Gauge is operational and the scenery work has just begun. The next Open House Weekend is August 27th and 28th. If you are in the Wichita area please come by and run some trains! Kansas State Fair ...WTTC will bring it's O-Gauge Modular Layout to the Kansas State Fair in Hutchinson, KS. We will set up the layout Thursday evening in the OZ building on the fairgrounds. Trains will be running all day Friday, Saturday, and Sunday during fair hours. The Wichita Toy Train Club set up their O-Gauge Modular Layout on Thursday night in the OZ Gallery. The layout was set up in a 3 x 1 configuration and trains were operated all day Friday, Saturday, and Sunday (Sept. 10,11 12). Hundreds of fair goers got to view trains and operate accessories each day. 1467 oil drums were loaded and 1243 logs were sawn over the course of three days by fair goers. Next event for WTTC will be their Train Show at Cessna Activity Center Sept. 24th and 25th....this is also a LCCA Special Event. Admission for both days is $7.00, kids under 12 free, LCCA Members free. 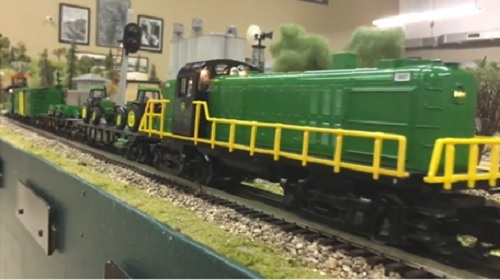 The 22nd annual Wichita Train show was held on Sept. 24th & 25th, run by the Wichita Toy Train Club & Museum. This was a special event for the LCCA and twenty LCCA members attended, with one being a new member signing up at the show. This event was hosted by John and Kathy Flinn for the LCCA. The total attendance for the two day show was 883 with approximately 170 vendor tables. The North room of the show featured layouts from G gauge down to N gauge. Upstairs in the activity center was the Kids Depot, an area that featured train rides, coloring, areas, operating O gauge trains, videos, and many other train related activities for kids to interact with. Lucky LCCA door prize winners were Esther Gable #40348, Jim Hickman #17605, Robert Dearden #26973, Mark Buckley #10601, and Lonnie DeMoret new member. Thanks to all who attended and hope to see you at our next show Nov. 5th & 6th in Arkansas City, KS. Oct. 8th 30th anniversary celebration dinner. The Wichita Toy Train Club put on the Arkansas City Train Show November 5th and 6th. This event was also a special event for the LCCA Club. Public attendance averaged 350 paid guests with kids 12 and under admitted from. The club showcased its O-Gauge modular layout with an additional table top S-Gauge layout to run trains. These photos show the LCCA table and the WTTC O-Gauge layout with push button accessories. Review of the Lionel Heritage Set of “O” scale freight cars. 27254 Western Pacific 60’ Box Car (6-27254), 27267 Southern Pacific 60’ Box Car (6-27267), 27396 Chicago and Northwestern Mechanical Reefer (6-27396), 27421 Missouri Pacific Hopper (6-27421), 27429 Katy PS-2 Hopper (6-27429), and 27434 Rio Grande PS -2 Hopper (6-27434). All of these cars feature die cast sprung trucks, which are painted silver. They are all full “O” scale cars with the boxcars measuring 15 ¼” long. The CNW reefer is 14 ¼” long and the hoppers are 12 ½” long. They match up to the scale size of the SD-70’s. They are painted with a glossy paint to match each respective SD70ace engine that the UP (and Lionel) decorated. These cars also feature add on details such as ladders, brake wheels, steps, hatches, open grating and opening doors. There is enough weight to each car so that they run very smoothly on all brands of “O” gauge track. I mainly run them on “072” and up curves. They may negotiate smaller curves, but really look best on the wider radius track. Produced in 08/09 they are occasionally found on hobby shop shelves, but you are more likely to find them online…eBay etc. Two other scale Heritage cars were produced, the 52475 WP boxcar and 52455 CNW tank car. These were produced as club cars for two different clubs in limited numbers. There was also a set of three traditional sized cars made, not the complete set of six. This 3 pack of PFE reefer set went along with the popular Vision Line reefer set, and will also be going along with the new Vision Line reefer set Cataloged in the 2016 Signature catalog. So right now you can have a 9 car PFE reefer train for your SP or UP late steam locomotives or early diesels. These cars are built very well with a number of separately applied metal parts. All of the cars have die-cast trucks and couplers along with metal ladders, break wheels and on the underside a bunch of metal break details. Each car has a very nice latch on each side for the doors and they open to reveal a simulated wood floor. The one sound car in the Vision Line set is simply put, amazing, the best way to explain the sounds is if you hear it. That being said it may be one car with sound but it will quickly fill the room up with sound even a decently large room. These cars run really smooth and will look good with just about any steam engine. I have only had a few issues that I am sure are isolated, the first being on one truck on the Vision Line set the springs were missing from the trucks, was kinda odd but fixed very quickly by a new truck that I screwed on that Lionel sent to me. The second, is the normal occasional coupler that decides it will uncouple whenever it pleases, that’s easily fixed by putting that car at the end of the train. The final issue happened just recently, the rivet holding the coupler to the truck ate its self out so the coupler kind of hangs low. But all and all these are wonderful cars and I hope to see more come in the future, maybe even in Lion-Scale, we’ll just have to wait and see. Enjoy your trains! The Wichita Toy Train Club recently received two American Flyer Scale Cylindrical Hoppers, The Canadian National 6-48639 Hopper and the 6-48641 UP Heritage MoPac Hopper. The CN Hopper is decorated in the colorful rainbow stripes on one side and plain gray on the other with the CN Canoodle on both sides. I believe the CN had an actual car painted in this scheme. The UP Hopper is painted in the MoPac Heritage scheme that matches the UP Heritage SD-70 MoPac engine (6-48177). I don’t believe there is an actual hopper painted in this scheme. This a photo of the two Hoppers on the under construction WTTC S Gauge layout. Each hopper features die cast trucks, operating couplers, opening hatches on the roof, separately hand applied metal details, and a length of 10 1/4”. The MoPac Hopper has silver painted trucks, the CN trucks are black. Both of these Hoppers are very colorful and we decided to have a contest to see which was the more popular paint scheme. At our Train Show the weekend of Sept. 24 & 25 we had a vote taken at our Kid’s Depot activities area. The results and comments are reported below by Shari Schockey our Club President. Children between the ages of 3 to 12 voted for their favorite hopper at the Kids Depot, part of 22nd Model Train Show and Swap Meet on Saturday, September 24. This was a major fund raising event for the Wichita Toy Train Club with proceeds going to the Wichita Toy Train Museum. The winner. #1, by five votes was the UP Cylindrical Hopper MOPAC. The main reason was the color and eagle. It looks faster. It has an eagle. Because it’s blue. It looks like it should go behind a steam engine. Like logo and paint sheen. It’s cool, MOPAC blue. Like Missouri Pacific Lines. It has the UP slogan “Proud Heritage, Powerful Future” on it. The runner up, #2, was the CN Cylindrical Hopper. The main reason was the colors, more colorful and rainbow colors. One boy likes Canadian style trains which this reminded him of. The impact of design does determine choice. This motorized unit by Lionel is listed as a 1955 Inspection truck. It resembles a Ford pickup truck of that time period. Part number 6-58267 was made exclusively for the LCCA as their 2016 registration gift for their annual convention in Kansas City, MO. It is decorated in Kansas City Southern “Southern Belle” colors, which is the current color scheme used on their diesels. This particular truck runs on O-gauge track in the forward direction only. The driving wheels that ride on the rails are partially hidden by the body of the truck and the truck’s tires. The truck is close to 1/48 scale, much closer to scale than other vehicles offered in the past. The headlights operate and are a blueish-white led lamps. A warning light on top of the cab is not illuminated. Add on’s include door handles, rear view mirror, gas filler cap, rear taillight, front & rear bumpers. The bed has stake sides with a tarp covering an unknown load. Inside the truck is a driver and steering wheel. The die cast frame gives this unit quite a bit of heft for good traction. Two center rail pickups on the bottom are spaced 2 ¾” apart and the truck runs smoothly thru most switches. Wheelbase of the rail driving wheels is 1 ¾” and the truck tire wheelbase is 3 ¼”. The KCS Logo is reproduced on each truck door and the tailgate. The year of production 2016 is also on each door and the back of the cab, with the lettering LCCA-46 on both bumpers. Top speed of this unit is not extremely fast, so even at 18 volts it stays on the curves well. This is an interesting unit that draws attention whenever is runs on the rails. This flat car is a standard Lionel O-27 flat car with a glossy black finish and a crisp John Deere logo on the top. Attached to the car are two John Deere spreaders that can be attached to the tractors on a flat car in the LionChief set. The car is tough and should be able to withstand years of use, and will look great with your John Deere set or any other train!